We all know that brushing our teeth is critical for good oral hygiene, but how important is flossing? If we’ve never done it before, should we even start? Can it be too late to begin flossing our teeth on a regular basis? It’s never too late to start flossing your teeth. And, like brushing, it’s just as important. 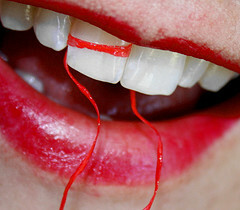 These tips will help you make flossing your teeth a part of your regular routine. There are many different kinds of floss, and the specific one that you choose depends on your teeth. If they have rough edges, you’ll want floss that resists shredding. If your teeth are tightly set together, you’ll want one that easily fits in between them. Other considerations for floss include flavored versus not flavored, waxed versus unwaxed, and the material that the floss is from. You may have to try a few different kinds of floss before you find one that you prefer. Get a length of floss that will clean each of your teeth, and wrap the ends around each index finger until a short section is ready to use. Starting with your front teeth, put that short segment of floss in between, gently working it through any narrow or tight spots. Wrap the floss around the edge of each tooth, gently scraping the edge as well as the base of each tooth and the space between it and your gumline. The pressure you use while flossing needs to be firm but not extreme. When moving the floss up and down between teeth, don’t press so hard that you cause injury to your gum. Use as much floss as you need in order to clean your teeth. It may take a few tries using floss to remove food particles. Make sure to use clean sections of floss as you floss one tooth to avoid spreading bacteria. Choose a time to floss that works for you. Maybe your morning routine as you get ready for work will help you remember to floss, or perhaps evening works better. Floss on-the-go. Purchase floss picks from the local grocery or drug store and stash them in your purse or your care for easy access. They’ll be there when you get food stuck in between your teeth and they’ll also help remind you to floss! Talk with your dentist. If it’s difficult to floss or you don’t feel confident, ask your dental hygienist to give you a lesson – they’ll be thrilled that you asked!